The arapaima, pirarucu, or paiche is a genus of bonytongue native to the Amazon and Essequibo basins in South America. They are the largest freshwater fish of South America, and among the largest fresh water fish anywhere. Ruby called this morning to wish me a happy birthday. She also asked me about a fish she bought for dinner two days ago at Whole Foods in Dallas: Paiche. It always surprises me when a fish, especially one that is sold in mainstream markets, is unfamiliar so I Google’d it. I discovered that Paiche is better known as Arapaima, an Amazon River staple and one of the largest freshwater fish in the world. It is long, stout and tapered like many other river behemoths. The fishing of Arapaima is said to be tightly controlled because overfishing has brought it nearly to extinction. This is the sadness, the moment any fish makes its way to the hungry world’s dinner table, that creature is already close to over-fished. Human efficiency at harvesting wild resources is devastating. Nearly every native and wold stock of fish that we eat is endangered. I asked Ruby if Whole Foods said whether the Paiche is wild or farmed and she thought wild but according to Wikipedia, Arapaima is not commercially fished but is aqua-cultured. Ironically, if aqua-cultured, Paiche would be safe to eat without fear of endangering it, although most aqua-cultured creatures retain little of the taste, vitality, or soul of their wild counterpart: like strawberries from California or French cherries. But I wont go into that now. No matter its place on our table or in the wild the beautiful Arapaima is a creature worthy of a moments admiration. As you may know, I think that the line between human and machine grows smaller every day. In fact, I’m not sure that some of us are not already machines. This article from the Guardian Website Today, June 9th, 2014 is worthy of a read. • What is the Turing test? And are we all doomed now? A “super computer” has duped humans into thinking it was a 13-year-old boy to become the first machine to pass the Turing test, experts have said. Five machines were tested at the Royal Society in central London to see if they could fool people into thinking they were humans during text-based conversations. The test was devised in 1950 by computer science pioneer and second world war codebreaker Alan Turing, who said that if a machine was indistinguishable from a human, then it was “thinking”. But “Eugene Goostman”, a computer programme developed to simulate a 13-year-old boy, managed to convince 33% of the judges that it was human, the university said. The successful machine was created by Russian-born Vladimir Veselov, who lives in the United States, and Ukrainian Eugene Demchenko, who lives in Russia. Warwick said having a computer with such artificial intelligence had “implications for society” and would serve as a “wake-up call to cybercrime”. The event on Saturday was poignant as it took place on the 60th anniversary of the death of Turing, who laid the foundations of modern computing. During the second world war, his critical work at Britain’s codebreaking centre at Bletchley Park helped shorten the conflict and save many thousands of lives. 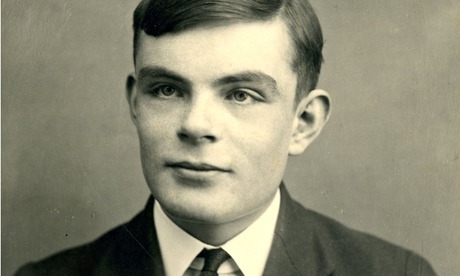 Instead of being hailed a hero, Turing was persecuted for his homosexuality. After his conviction in 1952 for gross indecency with a 19-year-old Manchester man, he was chemically castrated. Two years later, he died from cyanide poisoning in an apparent suicide, though there have been suggestions that his death was an accident. Last December, after a long campaign, Turing was given a posthumous royal pardon. In 2011, at the Techniche festival in Guwahati, India, an application called Cleverbot took part in a Turing-type test and was perceived to be human by 59.3% of its interlocutors (compared with a score of 63.3% human for the average human participant). However, because the programme draws on a database of real conversations, many disputed whether it was in fact exhibiting true “intelligence”.